Foodies, crime buffs, art lovers, and others interested in a more thematic approach to exploring Los Angeles will enjoy these unique offerings. A number of companies offer guided tours of the thriving street art in the Downtown LA Arts District. Quick Culture Art Tours offer regular and customized tours of LA art museums and neighborhoods. They have great tours designed to introduce children to the elements of art, but they're also great for adults who don't really have much background in art. You can check their calendar for tours offered, or book a private tour. Ghost tours are popular around the world and Los Angeles is no exception. We have our share of haunted buildings, ships, parks, graveyards, and other venues and plenty of historians, psychics and paranormal experts willing to point them out to you. Off 'N Running Tours takes runners and fitness walkers on guided tours of Beverly Hills and Santa Monica. The Running from the Paparazzi Tour covers 4 miles through Beverly Hills. The Marvelous Mansions Tour takes in 4.3 miles including a stop at the Greystone Mansion. The Pacific Pleasures Tour takes runners through Santa Monica's attractions. Esotouric is a tour company that offers very specialized thematic tours of Los Angeles. The subjects of the tours change, and they are not on a regular schedule so you have to plan around their date. Some popular tours they offer are the Black Dahlia Tour and Raymond Chandler's LA. Melting Pot offers 3 1/2-hour food tasting walking tours of 3rd Street from the LA Farmer's Market to the Beverly Center. Regular tours are scheduled Fridays and Saturdays year round. Private tours are also available on other days. The LA Metro offers regularly scheduled Metro Art Tours of the artwork in the Metro Rail system. Tours are led by trained Metro Docent Council volunteers. Free tours are offered the first Thursday, Saturday and Sunday of every month. Group tours can also be arranged at other times by special request. The tours are round trip and last approximately 2 hours. No reservations are required. First Thursday tours leave at 7 pm and First Saturday tours leave at 10 am from the street-level entrance to the Hollywood & Highland Metro Station near Highland Ave. First Sunday tours leave from the information booth at Union Station. The tours are 90% walking but include some Metro riding. Neon Cruises are double-decker bus tours of LA's most significant neon offered by the ​Museum of Neon Art. The tours are offered every Saturday from June through November. 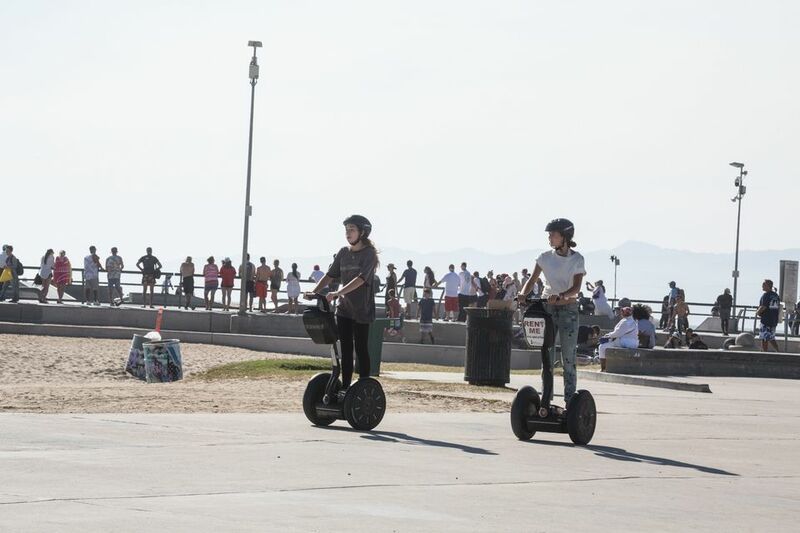 SegWow 2-hour guided Segway tours explore the most popular tourist areas or take on some more remote and rugged terrain on some local hiking trails, including up to the Hollywood Sign. They offer one of the few tours of the UCLA campus. You cover more distance in a shorter time than you could by walking, but standing for two hours can sometimes be harder on your feet than walking. LA Gang Tours is an innovative program where local gangs have agreed to a ceasefire and safe passage for tour buses to encourage real job creation in their own neighborhoods. Stops include jails, monumental graffiti zones, and sites relevant to the history of the development of gang culture in LA. The tour ends at the Pico Union Graff Lab (Graffiti Lab), where, in addition to seeing graffiti artists at work, there is the chance to have lunch and talk to gang intervention workers and former gang members. Take My Mother, Please! is a private tour guide who will take you, your mother or the whole family on a custom guided tour of the city.